Hanover, VA – Today, at approximately 12:14 p.m., the Sheriff’s Office responded to the 16000 block of Trainham Road for report of a shooting. Once on scene deputies located an adult male victim suffering from a gunshot wound who was pronounced deceased at the scene. The victim has been identified as Glen T. McMillan, Jr., 31, of Beaverdam, VA. 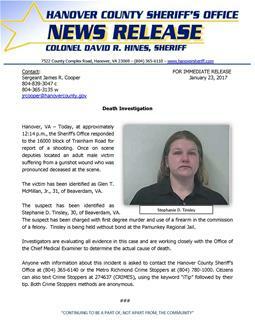 The suspect has been identified as Stephanie D. Tinsley, 30, of Beaverdam, VA. The suspect has been charged with first degree murder and use of a firearm in the commission of a felony. Tinsley is being held without bond at the Pamunkey Regional Jail. Investigators are evaluating all evidence in this case and are working closely with the Office of the Chief Medical Examiner to determine the actual cause of death. Anyone with information about this incident is asked to contact the Hanover County Sheriff’s Office at (804) 365-6140 or the Metro Richmond Crime Stoppers at (804) 780-1000. Citizens can also text Crime Stoppers at 274637 (CRIMES), using the keyword “iTip” followed by their tip. Both Crime Stoppers methods are anonymous. Hanover, VA – Today, at approximately 12:14 p.m., the Sheriff’s Office responded to the 16000 block of Trainham Road for report of a shooting. Once on scene deputies located an adult male victim suffering from obvious signs of trauma who was pronounced deceased at the scene. Investigators have detained one suspect for questioning. This is an isolated incident and there is no threat to the community. Investigators are evaluating all evidence in this case.